A little birdy told us that Universal Studios Home Entertainment is preparing Alfred Hitchcock’s The Birds for its high-definition debut. Amazon has listed the classic horror movie for pre-order on Blu-ray . The 1963 horror film is one of Hitchcock’s later works, coming three years after Psycho and two years after the wrap of his Alfred Hitchcock Presents TV show. 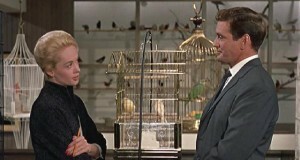 Nominated for an Academy Award for its effects, The Birds won a Golden Globe statue for star Tippi Hedren (Marnie) in the Most Promising Newcomer — Female category. It was Hedren’s first movie, and she went on to a long career of films and TV shows and hasn’t slowed down yet. Suzanne Pleshette (The Bob Newhart Show), Rod Taylor (Inglourious Basterds) and the late, wonderful Jessica Tandy (Driving Miss Daisy, Cocoon) also star in The Birds. The thriller follows Melanie Daniels (Hedren), a rich socialite, who drives north of San Francisco to Bodega Bay to see lawyer friend Mitch Brenner (Taylor), who’s staying in the town with his mother (Tandy) and sister (Veronica Cartwright). But shortly after Melanie arrives, the birds in the area start acting strangely. A seagull attacks Melanie, a neighbor is found dead from a bird attack, and soon, thousands of birds are attacking anyone and everyone they can find outdoors with no explanation as to why. As in all of Hitchcock’s movie’s, survival is the name of the game. The Birds was last released on DVD in a Collector’s Edition in 2000. The disc had a documentary, storyboard sequences, newsreels, deleted scene and original ending and Hedren’s screen test. So, we’re guessing the Blu-ray will have the same special features, if not more. Universal does a great job with its Hitchcock releases and brought out Psycho in a stunning Blu-ray package last year. A must-have for all Hitchcock fans — and fans of classic horrors and thrillers — The Birds on Blu-ray is one we’re looking forward to. We’ll let you know more about the release when we hear it. In the meantime, here’s a word from Hitchcock himself about this classic movie. Take it away, Alfred! Well… It’s 2013. Where’s the blu-ray movie? Still no news. But The Birds is still one I want on Blu-ray.